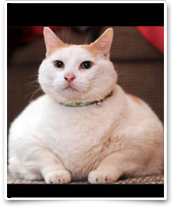 Obesity is an epidemic in cats, as it is humans. And, just like humans, cats suffer several special health risks. Obese cats (those with a body condition score of 4/5 or 5/5) have a 40% increased chance of developing Diabetes than their thinner counterparts. Obese cats have a 37% increased chance of developing Feline Inflammatory Cystitis than normal cats. 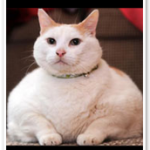 Obese cats are more likely to develop debilitating arthritis than normal cats. Cats tend to develop a lot of abdomen and intra thoracic (in the chest) fat as opposed to subcutaneous fat. (They are the “apple-shaped bodies” of the animal world). The unique risks associated with intra-abdomenal and intra-thoracic fat (called “Visceral fat”) have recently been studied in both humans and animals. This complex disease process is called ” Metabolic Syndrome”. FAT MAKES YOU HUNGRY, SO YOU GET MORE FAT- Visceral abdominal fat secretes a chemical that turns off a cat’s satiety center in his brain. This prevents the brain from recognizing signals from the stomach that it is full. The cat never knows when it is full; he may act hungry all the time, even though he is gaining weight! Of course, this only makes his obesity problem worse. FAT CAUSES INFLAMMATION- Visceral abdominal fat secretes inflammatory mediators. These chemicals make the cat more prone to inflammatory diseases such as Feline Inflammatory Cystitis (painful bladder disease), Osteoarthritis, Feline Stomatits (painful gum inflammation) and Feline Asthma (life-threatening)! Weight reduction can be the best thing you do to improve your cat’s bladder disease! Who knew?!? FAT CAUSES DIABETES MELLITUS- Visceral abdominal fat secretes a chemical called Resistin which makes cells Insulin Resistant—this is what causes Diabetes Mellitus in obese cats. To virtually prevent Diabetes, to reduce incidence and severity of painful Stomatitis and Cystitis and life-threatening Asthma, Overweight cats should lose weight.